" It’s an island, babe, if you don’t bring it here, you won’t find it here. " Master animator Hayao Miyazaki had announced that The Wind Rises would be his last film (since retracted). That makes some of the scenes about a brilliant career all the more pointed. The protagonist’s mentor believes that artists and engineers only have ten years of brilliant creativity in them. The first scene of The Wind Rises is Jiro’s sweet dream of racing above the countryside, wind across his skin. It ends with a crash and the disappointing reality that a boy who needs glasses will never be allowed to be a pilot. But Jiro (voiced in the American edition of this Japanese film by Joseph Gordon-Levitt) is able to adapt, by changing his dream to building airplanes rather than flying them. Jiro’s childhood dream cuts straight to his college days, where a peaceful train ride is interrupted by a terrible earthquake that sets fire to Tokyo. Jiro rescues a mother and daughter, and the threat of World War II looms larger. Soon Japan is rebuilding from the quake and Jiro lands his first job as an aeronautical engineer. To Jiro, his job must feel like the Manhattan Project: important work building machines that have never been built before, and which the country is counting on. Like the scientists at Los Alamos, Jiro and his peers are driven by the intellectual challenge, not bloodlust. In fact, Miyazaki goes out of his way to portray Jiro as a peace lover, once suggesting that their airplane could meet all requirements if they only ditched the extra weight of the weapons. Miyazaki gives plenty of screen time to Jiro’s auspicious introduction to the factory, to his humble wooden building, to his very desk “It’s foreign. None of the others wanted it.” The moment is lightened by the small stature, short temper, and big bouncy head of his boss Kurokawa (Martin Short). Once allowed to begin work, Jiro immerses himself completely. Jiro has the Feynmanesque ability to visualize forces and strains, from the perspective of the strut he’s been asked to improve as part of his initiation. It’s intriguing to see the story of World War II told from the perspective of a peace-loving Japanese engineer. For many Americans WWII started for Japan when it bombed Pearl Harbor. But here is a portrait of life in Japan leading up to the war, with a character involved in the war preparations. Even Yasojiru Ozu, whose career spanned the war and always showed us daily life in Japan, barely acknowledged the war. Jiro didn’t have time to improve the strut, and as a result his team loses the bid to build fighters. They are stuck building the lumbering bomber instead. So Jiro, his friend Honjô (John Krasinski), and some other engineers are sent to Germany to learn from Dr. Junkers how they are building airplanes over there. Miyazaki is not making a political film, but he does let Jiro see both poverty at home, and paranoid militancy in the German in the factory town. The other engineers return to Japan but Jiro is sent on a world tour. He is being groomed as a lead engineer, and his boss wants him to have lots of experience when he returns. Indeed when he does return, he’s put in charge of the next fighter program. The image from his dream, a sleek, v-winged raptor begins to take shape. Before you know it, Jiro’s prototype — what we would call a Zero (Jiro? Zero?) — is breaking speed records and sparking a buzz in the airplane-buidling circles. Prototype finished, Jiro takes a vacation. The airplane is in the hands of manufacturing now. At a rural spa, he meets a girl painting on a hillside, Nahoko (Emily Blunt). She turns out to be the daughter whose mother Jiro saved during the earthquake. She is at the retreat with her father because of the mountain’s reputed healing power. Jiro and Nahoko start a cinematically slow, sweet, courtship. Another guest at the resort is a German man (voiced by Werner Herzog). This mystery man seems to always be around. His good nature belies the ominousness of his unexplained presence. The last thing he says to Jiro before disappearing is that Mr. Hitler and his Nazis are up to no good, that Japan is doomed, and his own Germany is doomed. Frankly, this section of the film drags. 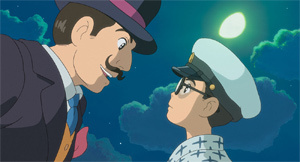 The Wind Rises is more than two hours long, and once Jiro meets Nahoko the pace changes dramatically. From here until the end — the final test of Jiro’s airplane and a coda with his mentor Caproni (Stanley Tucci) — there are many moments of Nahoko convalescing and Jiro working diligently, and not much visually happening. Jiro’s determined and laser-focused life looks very satisfying. I suspect that was part of the appeal of the story for Miyazaki, who also seems to have led an immersive life in his field. I wish I had always known what I wanted to do with my life, pursued it relentlessly, and enjoyed success. I think that’s why I love Miyazaki’s less-fantastical films like Kiki’s Delivery Service or Whisper of the Heart (which he wrote but didn’t direct) — because they are about young people finding their life’s calling. So even if The Wind Rises drags or detours a little, I’m willing to indulge in any side trips Miyazaki would like to take.